Be the first to share your favorite memory, photo or story of ISOBEL. This memorial page is dedicated for family, friends and future generations to celebrate the life of their loved one. OLSON, ISOBEL WARDHAUGH of Goodrich, Michigan. Died January 17, 2019. She was 98. Born October 27, 1920 in Bendigo, Australia to the late Edward and Minnie (nee: Black) Wardhaugh. 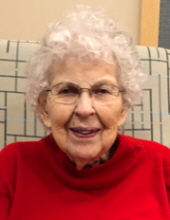 She is survived by her loving husband, Ano H. Olson; four children, Noni White, Doug (Carol) White, Frank (Patricia) Olson and Cathy Olson; daughter-in-law Nancy White; 12 grandchildren, Megan Olson, Jack Olson, Glenn Godau, Whitney Coggins, Ryan Godau, David White, Shawn White, Colleen White, Devin White, C.J. White, Connery Calkins and Easton Calkins; 17 great grandchildren, Jenny, Seth, Haley, Hope, Hailey, Conner, Isaac, David, John, Joseph, Grace, Charity, Gabrielle, Juliette, Lauren, Emily and Grant; also survived by 3 great great grandchildren; she was preceded in death by her first husband, Norman White; one son, Bruce White; one grandson, Chris Godau. Memorial service will be 5:30 p.m. Monday, February 4, 2019 at The River Church 9430 Perry Rd., Goodrich. Dinner following at the church. Memorial contributions may be made to The River Church, Goodrich. To send flowers or a remembrance gift to the family of ISOBEL WARDHAUGH OLSON, please visit our Tribute Store. Dinner following the Memorial Service. "Email Address" would like to share the life celebration of ISOBEL WARDHAUGH OLSON. Click on the "link" to go to share a favorite memory or leave a condolence message for the family.